Explanation: This rich starscape spans nearly 7 degrees on the sky, toward the Sagittarius spiral arm and the center of our Milky Way galaxy. A telescopic mosaic, it features well-known bright nebulae and star clusters cataloged by 18th century cosmic tourist Charles Messier. 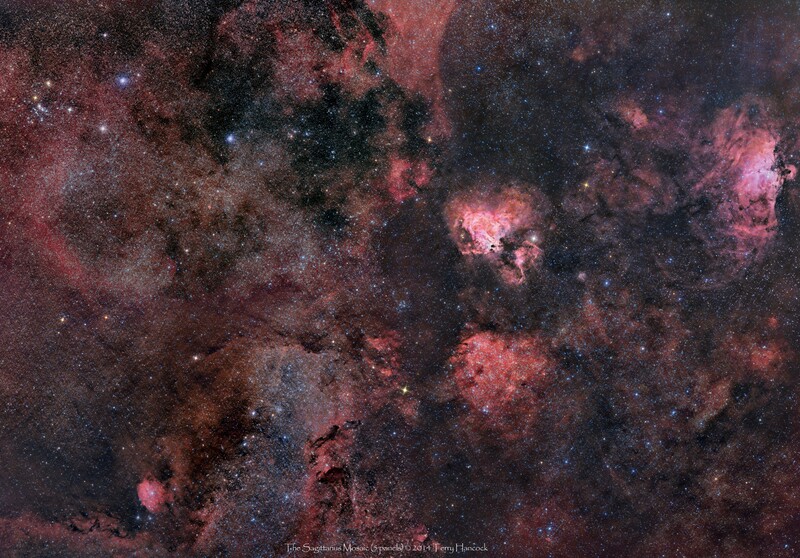 Still popular stops for skygazers M16, the Eagle (far right), and M17, the Swan (near center) nebulae are the brightest star-forming emission regions. With wingspans of 100 light-years or so, they shine with the telltale reddish glow of hydrogen atoms from over 5,000 light-years away. Colorful open star cluster M25 near the upper left edge of the scene is closer, a mere 2,000 light-years distant and about 20 light-years across. M24, also known as the Sagittarius Star Cloud, crowds in just left of center along the bottom of the frame, fainter and more distant Milky Way stars seen through a narrow window in obscuring fields of interstellar dust.